Ready. Set. Sale. 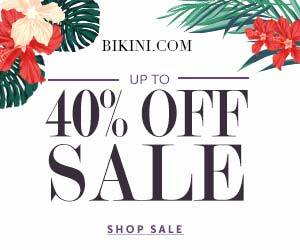 That's right, bikini women, if summer is here so are the sales on trendy swimsuits for all. Whose bikini collection couldn't use a little extra style this season? From the hottest colors of the season to the daring designs of the year, get ready to become the Bikini Queen this summer. This ruffled top will please all bikini women everywhere. It's a casual, innocent piece that will go with almost any pair of bottoms you have and provide the perfect amount of coverage. Check out this slight twist on the bandeau bikini style. This top combines floral accents and a solid background and with an adjustable eyelet, this bikini pulls off playful and sophisticated at the same time. If you thought you had to put your black and dark gray away just because the sun came out, you're wrong. It's pretty hard to resist this tasteful mix of dark gray, black and the large hibiscus pattern. For all you cheeky bikini women out there, this pair of bottoms is sure to find its way into your heart…almost literally. This little heart cutout is way too cute and will leave an even cuter mark behind after a day in the sun. This floral print is extra bright and happy. Does it remind you of cotton candy? Yes. Is that part of the reason you love it? Yes. This bikini top is a great mixture of both the high-neck style and the trending crochet look. This bikini has it all going on! You'll be rocking plenty of coverage while still catching eyes with the strappy design around the torso and the cutout just above the bust. What's more fun than creating some extra movement when you walk with the details of your bikini? Between the fringe and tassels on the sides of the bottoms, you'll be swaying perfectly with style. The color on this high waisted plus size bikini is to die for! The mesh cut outs on the side add an extra flirty flair. The super low cut of this bikini top is perfect for all of the daring bikini women out there. What's wrong with showing off a little extra this season?…Nothing!